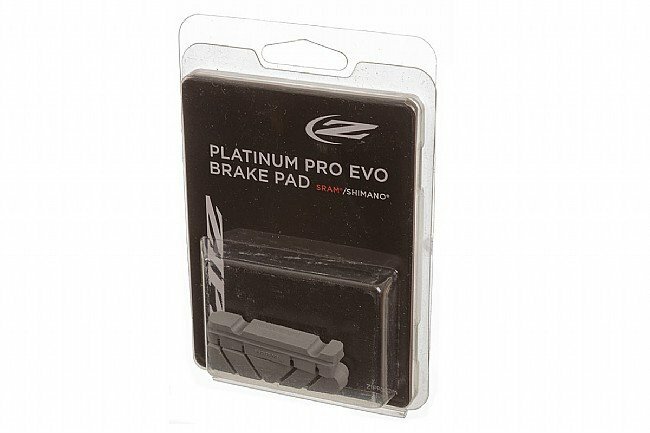 The Zipp Tangente Platinum Pro EVO Brake Pads are designed specifically for carbon brake tracks, providing predictable manipulation and all-conditions stopping power. Increased surface area provides more friction and less wear than previous models, and the updated groove design evacuates water more effectively and channels air for increased cooling. Additional temperature management has been integrated into the compound to reduce the chances of overheating during hard or prolonged braking. The Tangente Platinum Pro EVO Brake Pads are available for Shimano/SRAM and Campagnolo style brakes. Two pads per package, enough for one brake. I been using these brake pads on my Zipp rims for a few years now. First, the positives, goodreasonable braking in all conditions, (wet a little worse) bad, way too expensive for what you get and they wear out somewhat fast (2000-3500 miles). Caveats here are I am using them on some really hilly courses and I am no lightweight but the best price overall is through biketiresdirect.com and of course, if you go, you gotta stop, eh? These pads are expensive, but they do a good job of stopping and they last fairly long. Naturally, their effectiveness is also governed by the break track on your carbon wheels. Stopping is really important especially when you spend a lot of money on your bike and wheels. I'm okay spending extra for a quality product and this is a quality product. And they work. Nothing better for Zipp wheels although a bit pricey and wears quickly. Works very well with Zipp break tracks in all weather. Soft compound provides no squeal, tenacious grab, and oddly I have had no imbedded debris. High price but well worth it on Daily Special. Great brake pads. Full stop. (Pun intended). Don't make this complicated. If you are running Zipp carbon wheels... You want these brake pads. These work great. I have them on 202s and they have excellent stopping power in the dry and good power in the wet. These are to be used with carbon rims, and in dry conditions they are indistinguishable from alloy rims. Still good stopping power in the wet. Zipp wheel warranty says you must use carbon-specific brake pads and these are good ones.